This month's journal quilt is based on a seascape or a cityscape. 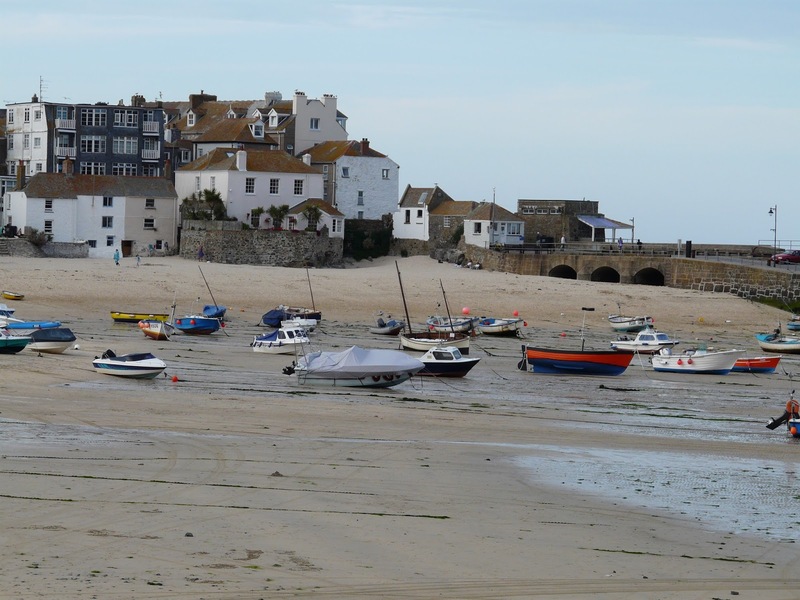 I had several photos from a trip some years ago to Cornwall and I particularly liked this one of St. Ives. I put together a selection of photos in my sketchbook to inspire me. The bottom two photos are of the harbour in Mousehole. (Pronounced Mouzzall). I really don't spend time sketching so this was way out of my comfort zone. I drew with pencil and then coloured the page with NeoColor II watercolour crayons and then did a water wash over it. I drew round the houses and boats with a black pen. I went to the quilt show at Uttoxeter and whilst I was there I bought some hand dyed fabrics. I ironed some Heat and Bond onto some pieces of material. I traced my drawing and then used the tracing to cut out the shapes from the fabric and ironed them on. I machine stitched the lines round the houses and the boats. I didn't much like the straight line where the sand met the sea so I randomly machined along the join. I added hand stitching for the chains that hold the boats. I also handstitched along some of the patterns in the fabric that represents the sea. I have yet to bind any of my Journal quilts. You can see the one for March here. I have been sharing the April one during each stage on Facebook and someone contacted me about me making a quilted book cover using the April design. Wow! Exciting. And more excitement to come this week. Tomorrow the The Art of Practising Gratitude starts. I hope you will join in. To ensure you get every blog post, sign up for the emails by putting your email address in the box at the bottom of the blog page at The Art of Practising Gratitude. I look forward to seeing you there. I started working on an altered book for my new challenge blog The Art of Practising Gratitude. Usually I use an old book I already own or I recycle one very cheaply from a charity shop but this time I bought a book in the cheap section of Barnes & Noble because of its title: A Simple Act of Gratitude. I read the book on my journey home. It is the story of a man who decides he will write one thank you letter every day for a year and what happens to him as a result. The art of practising gratitude really changes his life. When I removed the paper cover I found a really beautiful hard cover just right for altering. When you make an altered book it is better to use one that is sewn together, however this one was glued. For more information on altering books have a look at this post and this. I probably won't be folding any of the pages in this book as I did in Passport to Art. The book needs to have some pages removed so that it doesn't become too bulky but first I decided I would go through the book and mark some places where there were words I wanted to keep. Often this is called Found Poetry but for me it was just key words that were relevant to gratitude. As I went through I drew pencil boxes and wrote down the page numbers. As you choose the words don't think about the sense they make in terms of the page they are on or the story they are in. Just choose words that appeal to you particularly about Gratitude. I pulled some of the pages out in between the marked pages (often 3 or 4) and glued the remaining pages together in groups of 3 or 4. Don't throw any of the torn out pages away yet. You might need them to make extra pages for your book, make flaps or use them in other collage projects. I went through the pages using clear gesso on the words I wanted to keep. If you don't have any clear gesso use small pieces of washi tape or low tack painter's tape to cover up the words you want to keep. You can remove this once you've painted over the rest of the page. I used gluestick rather than wet glue because the paper wasn't terribly good quality and I didn't want a lot of wrinkles in the stuck together pages. You do still get some wrinkling but it adds to the texture of the finished book. Here you can see where I've pulled a few pages out and the rest of the book to do. Make sure you glue together two pages either side of some you've pulled out to cover up the rough edges and to strengthen the spine. When the glue and the clear gesso was dry, I started painting each page of the book. It is over a month since I wrote the challenges for The Art of Practising Gratitude so I have cannot remember what art challenges I've put. I decided that if I painted every page with acrylic paint - you could use gesso - then when I come to actually complete each day's challenge I won't be nervous about starting the page because it already has some paint on it. If it doesn't suit that day's challenge I can always stick one of the pulled out pages over it or a coat of gesso. A small amount of paint on the throwaway plate. The page with the clear gesso before paint is applied. The paint over the whole page. The paint wiped off with a wet wipe to reveal the words. If when I come to do the journal page the words are not relevant or I need to cover them over with something else because of the instructions for that day, then so be it. I do hope you will join in with The Art of Practising Gratitude. Go over to the blog and join up by email so that you get every blog post. Ask to join the Facebook group. It will be good to see you. An update of the update or what happened to the planner? Firstly, the update of the update as promised yesterday. I left you with this picture. My planner was already bulging and we are only on week 17 of 52 so having looked at some photos in the Facebook group of how people had performed surgery on their planners I took the plunge. Here is the planner before surgery and how it had looked before starting the Document Life Project. When I removed the cover there was a paper binding and on removing that I found a heavily glued webbing which I also cut through which left me with the covers and 5 sections of the book. At this point some anxiety set in! I tried not to panic! I had some repair tissue which is actually intended for repairing books so with some Heavy Gel Medium I attached the tissue over the 5 sections of the book and stood it up between two objects so that it could dry. Then I came to write this post, so at this point you are as wise as me whether any of this going to work. I do hope so because this planner is one of the few things I've worked on where I've liked what I've done at the time rather than when I come back to it sometime later! Tick! Tock! Tick! Tock! Tick! Tock! Tick! Tock! The glue dried on the tissue. By the way in the States it's called Japanese tissue. It's stronger than ordinary tissue paper and doesn't mind getting wet. In the UK you can buy it from Crafty Notions. Still using the Heavy Gel Medium I glued the covers to the planner. Then I cut a piece of sticky backed canvas and wrapped that around the book. It will stick to the covers but not to the spine. And later I can paint it if I wish. Inside there were pages that had parted company. But I went through with tissue tape and repaired them. And what a relief! The planner is back in working order. I think I may have to keep an eye on it as it fills up but as you know I have plenty of washi tape to repair it with! Now I'm off to alter another book for my new project The Art of Practising Gratitude. You can join in too! I would love it if you did. On to the Documented Life update. You can see other Documented Life posts by clicking on Documented Life Project at the bottom of this post. The challenge was to use bits cut from magazines. I punched the butterflies. The challenge was to have someone else draw in your book and as I couldn't cope with that I stamped with a Dyan Reaveley stamp. I thought that might count since I know her! The challenge was to write your name and decorate it. It probably needs some more doodling. I ignored this week's challenge. And then I took the scissors to the spine of my Planner and cut it open! Come back tomorrow for an update of the update! And what happened to the planner! My last day in Florida involved a last trip to Michaels to buy a gift for a friend - I'd had to wait until I was packed to see if I could fit any more within the luggage allowance. I was actually 2Kg under! Then I visited the Ruth Funk Center for Textile Arts at Florida Institute of Technology. They had this Ceremonial Robe on display. Just outside the Gallery is the Botanical Garden, so despite the heat I went for a walk around it. There were quotes on some of the benches. I thought of you, Hilary Beattie, when I took this photo. And when I got back to the car, which I had parked in the shade this is what it said. 94F. That's 34.5C. HOT! I always tune the radio in the rental car to Z88 - a Christian channel. Then I drove to Eau Gallie to have lunch at Squid Lips. It is on the edge of the Indian River. Sadly there weren't the usual Pelicans. I started driving to the airport stopping off again at the Viera Mall. The clouds were gathering and the radio kept interrupting the programme with severe weather warnings of Thunderstorms and 60 mph winds. I started driving up I-95 and the heavens opened and the rain poured down. Just after I took this last photo (yes I know it was dangerous to be driving and taking a photo) the rain increased and I couldn't see the road in front of me. I took the next exit after that and parked in a fast food car park until the rain stopped. I got back on the I-95 and then onto US528 when the rain started again. I was driving quite slowly - 55 mph in a 70 limit - when a large truck overtook me and the spray and the rain meant I couldn't see anything at all. I have never been so frightened. You can imagine how much I was praying. The rain stopped as suddenly as it had begun and the road was totally dry for the last 5 miles to the airport. Thank goodness.